A corp oration is the most common business structure in Canada. There are many benefits to incorporating your business, including income tax, legal and funding considerations. Income tax time is here. I’ll be posting some articles soon on income tax for professionals. In the meantime, here is a related article I wrote for medical residents and their first income tax return after residency. Transitioning to medical practice from residency is a big step. Completing the requirements of the program, writing certification exams, finding work, getting licensed, applying for hospital privileges, setting up CMPA coverage, etc. There is so much to be done before you can start practicing. Some things get pushed aside until it’s time to deal with them. Income tax is often one of those things. And with April 30 approaching, it’s now time. Like the TFSA and RRSP, the professional corporation is an important tool for investing and saving. By incorporating your practice or business and investing unused funds within the corporation, you will end up with significantly more money in the future than if you did all your investing personally. Advocates of incorporation always cite the tax deferral resulting from the difference in the small business rate on active income within a professional corporation compared to the personal tax rates on the same income as being one of the primary reasons to incorporate. You can keep more after tax money in the company to invest than if you earned it personally. There are several income tax advantaged investment vehicles in Canada, the best known being the Tax Free Savings Account (TFSA) and the Registered Retirement Savings Plan (RRSP). Using these tools for investing gives you more funds in the future compared to investing without them. The aim of this blog is to provide accounting, tax and financial information for various professionals. However, much of the information has been geared towards physicians. While a lawyer or dentist will be interested in articles on tax planning and incorporation, they won`t care much for articles on the Contributory Professional Retirement Savings Plan for physicians. Although professions have many income tax, accounting, and financial planning similarities, there are also many issues specific to a particular profession. I am going to continue with general information in The Professional Edge, but I will be developing separate blogs for some of the professions. The first of these new blogs is The Medical Accountant. It`s a work in progress, but I hope to fill it with useful information specific to BC physicians including BCMA negotiated benefits, GST in clinics, transitioning into practice, BCMA health insurance, and much more. Please take a look, and let me know of any topics that you would like to see covered. Because a company is taxed at a much lower rate on business income than an individual, there is the potential for a large tax deferral. Consider a professional who earns $300,000, but only needs $200,000 before tax for personal use. 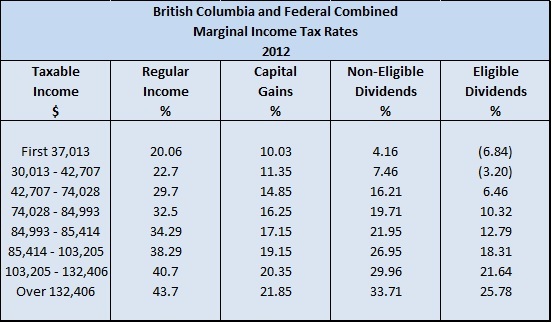 If earned personally in BC, the remaining $100,000 would attract $44,000 of tax, leaving $56,000. If earned by the company, and not taken out, the tax will only be $13,500, leaving $86,500. Income splitting with wages can save you thousands of dollars. Income splitting with dividends from a professional corporation can save you tens, even hundreds, of thousands of dollars. My last post explained how income splitting works. In this post, I am going to provide examples of the benefits of income splitting. I just conducted a workshop for the Professional Association of Residents of British Columbia (PAR-BC) on transitioning to practice for medical residents. In my ongoing series on professional incorporation, I’ve discussed what a professional corporation is (a distinct legal entity) and which professions allow incorporation (doctors, dentists, lawyers and realtors among many others). I’ve shown how the lower corporate tax rates can assist a professional in a practice or equipment acquisition and help retire business debt faster. And I’ve shown how salary and dividends paid by a company, although treated differently for income tax purposes, combine to put a professional in the same position as if they had earned the income directly themselves. But if that’s the case, unless you have large non-deductible expenditures, incorporation doesn’t appear very helpful. In my last post, I discussed the lower tax rates on professional income earned in a corporation. In BC, any professional income that you earn personally in excess of $132,000 is taxed at 43.7%. In a professional corporation, the first $500,000 of that income is only taxed at 13.5%. That’s a difference of over 30%. Sounds pretty good to me. Lower tax rate means less tax. Less tax means more money. More money means…. The British Columbia Medical Association (BCMA) has recently released the 2012 entitlement amounts for the Contributory Professional Retirement Savings Plan (CPRSP). If you are an eligible physician in British Columbia, you should have received notification of your entitlement. As I noted previously, there are several benefits to incorporating your practice. One of the greatest advantages of a professional corporation is access to lower income tax rates. In Canada, we have a progressive tax system. As you earn more personally, your income is taxed at progressively higher rates. Only income within each tax bracket is taxed at the applicable rate. As you can see, various types of income are taxed at different rates. For the time being, I am only concerned with the basic tax rates for “regular income” such as employment and business/professional income. I’ll discuss the tax advantaged rates on the other forms of income in later posts. In my last post, I discussed which professions can incorporate in British Columbia. But why would you want to incorporate your practice? Because the other doctors or dentists in your clinic have incorporated, or the other lawyers in your office have their own professional corporations? Because your accountant / lawyer / investment advisor / golf buddy told you to? But they’re right. You should understand why you are doing something before actually undertaking it.